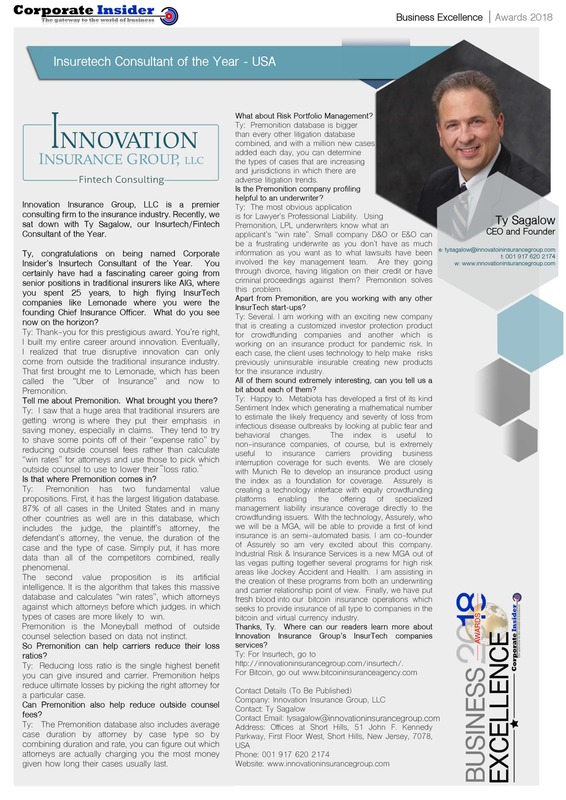 Coming off the heels of his 2017 InsurTech Consultant of the Year Award from Acquisition International, Ty Sagalow, Premonition’s Chief Insurance Officer was the 2018 InsurTech Consultant of the Year from Corporate Insider. In Corporate Insider’s interview with Mr. Sagalow, he talks about why he joined Premonition and how he sees the future of LegalTech. Ty, congratulations on being named Corporate Insider’s Insurtech Consultant of the Year. You certainly have had a fascinating career going from senior positions in traditional insurers like AIG, where you spent 25 years, to high flying lnsurTech companies like Lemonade where you were the founding Chief Insurance Officer. What do you see now on the horizon? Ty: Thank-you for this prestigious award. You’re right, I built my entire career around innovation. Eventually, l realized that true disruptive innovation can only come from outside the traditional insurance industry. That first brought me to Lemonade, which has been called the “Uber of Insurance” and now to Premonition. Tell me about Premonition. What brought you there? Is that where Premonition comes in? Ty: Premonition has two fundamental value propositions. First, it has the largest litigation database. 87% of all cases in the United States and in many other countries as well are in this database, which includes the judge, the plaintiff’s attorney, the defendant’s attorney, the venue, the duration of the case and the type of case. Simply put, it has more data than all of the competitors combined, really phenomenal. The second value proposition is its artificial intelligence. It is the algorithm that takes this massive database and calculates “win rates”, which attorneys against which attorneys before which judges, in which types of cases are more likely to win. Premonition is the Moneyball method of outside counsel selection based on data not instinct. So Premonition can help carriers reduce their loss ratios? Ty: Reducing loss ratio is the single highest benefit you can give insured and carrier. Premonition helps reduce ultimate losses by picking the right attorney for a particular case. Can Premonition also help reduce outside counsel fees? Ty: The Premonition database also includes average case duration by attorney by case type so by combining duration and rate, you can figure out which attorneys are actually charging you the most money given how long their cases usually last. What about Risk Portfolio Management? Ty: Premonition database is bigger than every other litigation database combined, and with a million new cases added each day, you can determine the types of cases that are increasing and jurisdictions in which there are adverse litigation trends. Is the Premonition company profiling helpful to an underwriter? Ty: The most obvious application is for Lawyer’s Professional Liability. Using Premonition, LPL underwriters know what an applicant’s “win rate”. Small company D&O or E&O can be a frustrating underwrite as you don’t have as much information as you want as to what lawsuits have been involved the key management team. Are they going through divorce, having litigation on their credit or have criminal proceedings against them? Premonition solves this problem. Apart from Premonition, are you working with any other lnsurTech start-ups? Ty: Several. l am working with an exciting new company that is creating a customized investor protection product for crowdfunding companies and another which is working on an insurance product for pandemic risk. In each case, the client uses technology to help make risks previously uninsurable insurable creating new products for the insurance industry. All of them sound extremely interesting, can you tell us a bit about each of them? Ty: Happy to. Metabiota has developed a first of its kind Sentiment Index which generating a mathematical number to estimate the likely frequency and severity of loss from infectious disease outbreaks by looking at public fear and behavioral changes. The index is useful to non-insurance companies, of course, but is extremely useful to insurance carriers providing business interruption coverage for such events. We are working closely with Munich Re to develop an insurance product using the index as a foundation for coverage. Assurely is creating a technology interface with equity crowdfunding platforms enabling the offering of specialized management liability insurance coverage directly to the crowdfunding issuers. With the technology, Assurely, who we will be a MGA, will be able to provide a first of its kind insurance on a semi-automated basis. l am co-founder of Assurely so am very excited about this company. Industrial Risk & Insurance Services is a new MGA out of Las Vegas putting together several programs for high risk areas like Jockey Accident and Health. l am assisting in the creation of these programs from both an underwriting and carrier relationship point of view. Finally, we have put fresh blood into our bitcoin insurance operations which seeks to provide insurance of all type to companies in the bitcoin and virtual currency industry. Thanks, Ty. Where can our readers learn more about Innovation Insurance Group’s InsureTech companies services? Ty: For Insurtech, go to http://innovationinsurancegroup.com/insurtech/.